Porpoises are small cetaceans of the family Phocoenidae. Porpoises belong to the "toothed whales" suborder Odontoceti, along with whales and dolphins. Although scientifically the term porpoise should be reserved for members of the family Phocoenidae, historically the term often has been applied in common vernacular to any small cetacean, especially by sailors and fishermen (Grzimek 2004). Aquatic and fish-like, but in reality air-breathing mammals, porpoises reflect the stage-by-stage nature of development seen in the life cycle of all living organisms and the geologic timescale of Earth's history. Considered to have developed on the foundation of terrestrial mammals millions of years ago, even the bones in the flippers of a porpoise resemble those of the hands, forelegs, and wings of terrestrial mammals, like humans, ungulates, and bats. Porpoises, divided into six species, live in all oceans, mostly near the shore, with the finless porpoise (Neophocaena phocaenoides) having populations that also live in freshwater environments. Probably best known is the harbor porpoise (Phocoena phocoena), which can be found across the Northern Hemisphere. The vaquita (Phocoena sinus) is seriously endangered as a result of chemical pollution, habitat loss, and being caught in fishermen's nets. As mammals, cetaceanns are warm-blooded, breathe air, and feed their young on milk. They give birth to live young, as with most mammals (except monotremes). Hair, a characteristic of mammals, is present in porpoises at least in some stage in their development, but they are nearly hairless, like other cetaceans. They also share with other cetaceans a fusiform (spindle-shaped) body with anterior limbs in the form of flippers, and a flat, notched tail with horizontal flukes that lacks bony support. Like other members of the Odontoceti suborder, porpoises have only one blowhole and have the main bones of the upper jaw thrust upward and back over the eye sockets (Grzimek 2004). In common use, the term porpoise is often applied to dolphins. There is no strict definition of the term dolphin (Grzimek 2004), but it generally is used either for members of the Odontoceti family Delphinidae or for any member of the families Delphinidae and Platanistoidea. Porpoises tend to be smaller but stouter than dolphins. They have small, rounded heads and blunt jaws instead of beaks like the Delphinidae. While delphinids typically have a round, bulbous "melon," a round organ used in echolocation, most porpoises lack a melon. Phocoenid teeth are flattened and spade-shaped, whereas dolphins have conical teeth. In addition, a porpoise's dorsal fin is generally triangular, rather than curved like that of many dolphins and large whales. (Some Delphinidae and Phocoenidae lack dorsal fins.) Some phocoenid species have small bumps, known as tubercles, on the leading edge of the dorsal fin. The function of these bumps is unknown (Read 1999). Porpoises are the smallest cetaceans, reaching body lengths up to 2.5 m (8 feet). They are intelligent and friendly mammals. Because of their small size, porpoises lose body heat to the water more rapidly than other cetaceans. Their stout shape, which minimizes surface area, may be an adaptation to reduce heat loss. Thick blubber also insulates them from the cold. The small size of porpoises requires them to eat frequently, rather than depending on fat reserves (Read 1999). Porpoises, along with whales and dolphins, are considered to be descendants of land-living mammals and to be related to hoofed animals. It is believed that they entered the water roughly 50 million years ago. Burmeister's porpoises are found in sub-Antarctic and temperate coastal waters of southern South America, while the spectacled porpoise has been spotted in a variety of locations, but seems to be most common in the southern Atlantic coast of South America (WDCS 2007). On the other hand, Dall's porpoise is found north of the equator, being located in the warm temperate and sub-arctic waters of the North Pacific Ocean (WDCS 2007). The well-known harbor porpoise is found in the sub-arctic and cool temperate coastal waters of the North Pacific and North Atlantic, and is the only member of the family found in European waters (WDCS 2007). The finless porpoise is found in both marine environments and freshwater. There are three varieties known, with one living in the Yangtze River of China, one in coastal waters around Japan and Korea, and one living in coastal and riverine waters in areas of Asia (WCDS 2007). The vaquita is only found in the northern end of the Gulf of California (Sea of Cortez), being confined to a 30-mile radius; it is on the brink of extinction, having a population estimated at only between 100 and 500 individuals (WCDS 2007). Recently discovered hybrids between male harbor porpoises and female Dall's porpoises indicate that the two species may actually be members of the same genus (Read 1999). Porpoises are relatively r-selected compared with dolphins: that is, they rear young more quickly than dolphins. Female Dall's and harbor porpoises often become pregnant with a single calf each year, and pregnancy lasts for about 11 months. Although the lifespan of most species is not known, specimens older than in their mid-teens have rarely been found (Reed 1999). Porpoises are predators of fish, squid, and crustaceans. Although they are capable of dives up to 200 m, they generally hunt in shallow coastal waters. They are found most commonly in small groups of fewer than ten individuals. Rarely, some species form brief aggregations of several hundred animals. Like all toothed whales, porpoises are capable of echolocation for finding prey and group coordination. Porpoises are fast swimmers. Dall's porpoise is said to be one of the fastest cetaceans, with a speed of 55 km/h (15 m/s). Unlike the delphinids, which often leap out the water and bow-ride on the wave of a ship, phocoenids rarely are observed doing this. Porpoises tend to be less acrobatic and more wary than dolphins. Accidental entanglement (bycatch) in fishing nets is the main threat to porpoises today. The vaquita, with its limited distribution in a highly industrialized area, also faces problems from habitat loss and chemical pollution. In some countries, porpoises are hunted for food or bait meat. 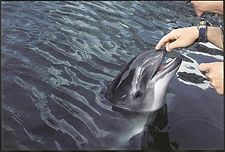 Porpoises are rarely held in captivity in zoos or oceanaria, as they are generally not as capable of adapting to tank life nor as easily trained as dolphins. Whale and Dolphin Conservation Society (WDCS). 2007. Porpoises. Whale and Dolphin Conservation Society. Retrieved March 25, 2007. This page was last modified on 7 September 2009, at 15:09.